I am now running windows 7 32bit as dual booted instead of through VMWARE and had no issues. Hey Mrtanz can I get you to code my e92 for the usual suspects? Thats great tanz, do you thinks that's why you had issues with coding my car? OK with a bit more of an opportunity to drive the car over the past few days all I can say is wow! The car feels like it has an extra 40kw or so (just like when I plugged in the procede) and it literally has more power everywhere. Whilst it was certainly an expensive mod (DP's FMIC &CP) I'm definitely glad I spent it! The exhaust note is definitely louder, even the missus picked up on that and she has no idea about cars and has a much deeper note when giving it some. A bit disconcerting was the flapping tractor like noise I could hear on cold starts. I asked Pete is that an exhaust leak and he said it was just the wastegates, once the car warms up it will disappear which it does. I'm unsure if its normal, but the idle seems slightly rougher on cold starts also. This maybe something that can be tweaked with the procede...? The tractor type noise on startup seems to have dissapeared and the rough idle has now also subdued and is back to normal. I imagine due to the catless DP's and larger intake & fmic the ecu had to adjust to suit? So will the wavetrac lsd and m3 subframe bushes pretty much eliminate my issues or should I go further and upgrade further suspension components when the rear subframe is dropped to to install the lsd diff centre? Hey Shane, an LSD and subframe will not drastically improve you going over corrugations on the road i don't think. I would go suspension mods first (coilovers) as i have zero issues putting power to the ground and i'm running 275 rears. Well its not just the going over the corrugations in the road that is the issue, basically when the power is on the rear end is being unsettled and is squirming around. The addition of the bumps unsettles the rear for traction even more hence the DTC cutting in too soon imo. I have read the M3 rear subframe helps a lot with the bump steer issues, was hoping the guys who have an lsd and m3 bushes could chime in. Justin showed me his car with a heap of megan chassis bracing when up on the hoist at advan that I thought might help in this scenario? Interesting that you have zero traction issues though Ian!?! Surely you have the DTC kicking in when driving hard coming out of corners etc? Perhaps the 6mt and the dct have different power deliveries thus the dct is somewhat smoother? yeah, i seem to stick on the ground when going round corners! May be a combination of my 20" rims and coilovers that give me that extra grip, but i do get the DTC light up also if there are abrupt corrugations in the road (that's normal). From what i've read and researched, the coilovers are a better BYFB mod for street purposes. The Traction issues you describe will not be solved by suspension changes. I'd still get it done to tighten up the rear and eliminate the "squirm" as it's an uncomfortable feeling when ya arse changes lane for ya!!! The rear end is probably too stiff. What profile tyres are you running? How much pressure in the rear tyres? What suspension? If on coilovers you can adjust the dampening to be softer. Hmm Im on oem sport suspension, 265/30 19", 42 psi and unfortunately cannot adjust bump/rebound for obvious reasons! I have always ran 40+ to minimise the inner tread block from wear also. Also by the time you go to recheck (usually once a month) they have dropped 1-2psi so runing 42psi gives me some safety margin. Snapped a pic of the engine bay this sarvo, the BOV certainly stands out like dogs balls so hopefully the rozzers don't ever ask me to pop the hood in a defect station! Yes but its all about trade offs. Can't have it all. Drop it to 36-38 psi and see if you have the same issue coming out of a corner. Just a suggestion anyway. Curious as to how it sounds... I went with Forge DV's for stock look. 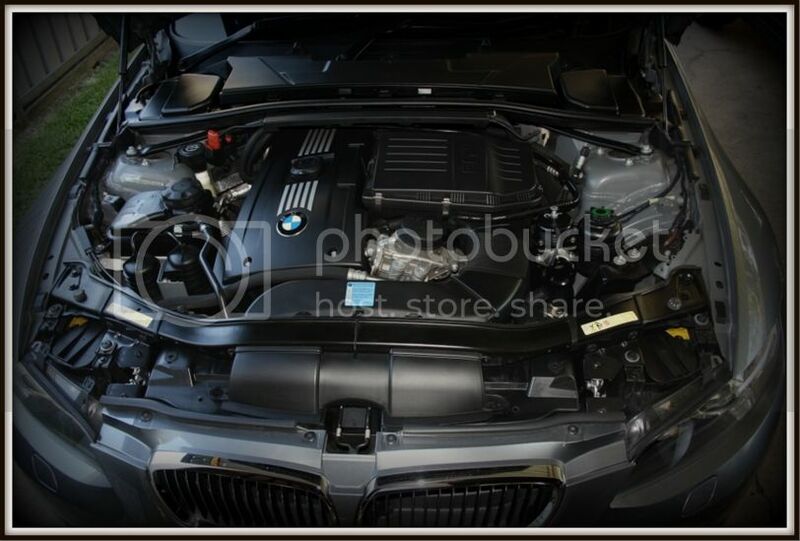 I have been researching this, and some guys upgrade the diff mount bushings m3 subframe bushes and megan toe link arms (or m3 items) and state that the rear end is a lot more planted after these mods and for the power im putting out should be more then sufficient once I have the lsd in and some fresh dampers/coilovers. Last edited by DR-JEKL; 01-05-2013 at 06:52 PM. Next time I see you mate you can take it for a drive. P.S Do your bc's have adjustable front camber plates? Awesome mate, doesn't sound bad at all! Yes the BC coilovers have front camber plates mate. Man, how clean is that engine bay? Also what are the cool function that one can code to the car?